In auditioning singers the trial was ‘Mistreated’. Bonnet allegedly got the job just three syllables in! ‘’I’ve been Mis...’’ Strangely enough it was Bonnet who recommended Roger Glover for the still vacant bass role. This was the final missing piece as Glover’s writing and production was geared more towards a more commercial sound that Blackmore desperately wanted out of Rainbow. Despite existing fans reservations about the direction, ‘Down To Earth’ became their best selling album. It introduced Rainbow to a much wider audience and it spurned two hit singles, and Blackmore’s desire to have his songs played on jukeboxes and radio was for all to see. 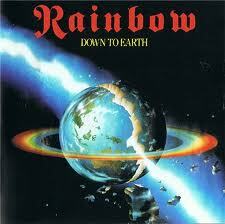 Less than 12 months after its release Powell had left, and in came a new era for Rainbow fans. Despite that, this is a fitting testament to the Bonnet fronted version of the band. After the first 3 studio albums of the Dio era, ‘Down to Earth’ still holds up well against all the others in the Rainbow catalogue.